The ‘share’ is the holy grail of content engagement. Sure, your content might be good enough to ‘like’. Or even worthy of a ‘comment’. But there’s no better sign that your content’s on the money than when it’s shared. There’s an art to creating content that’s good enough to share — it’s an elusive aim that’s far easier to track retrospectively than achieve proactively. 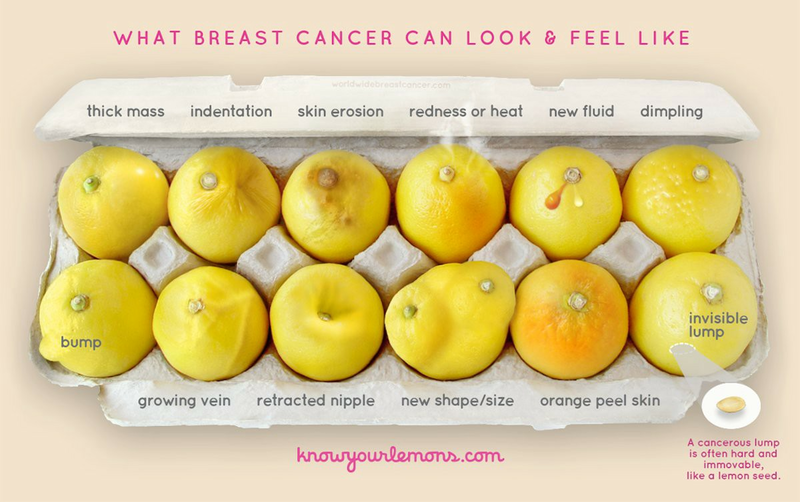 But thankfully, there’s also a bit of science to it too. Here we’ll try to cover both. A share shows something’s bang on for an audience — they like it enough not only to tell their network, but to have that content reflect their identity. It’s the clearest indication that someone truly cares about what you’re saying. Shares also increase reach and exposure exponentially. If something’s inherently shareable, then it’ll get far more visibility than if it’s just good viewing. 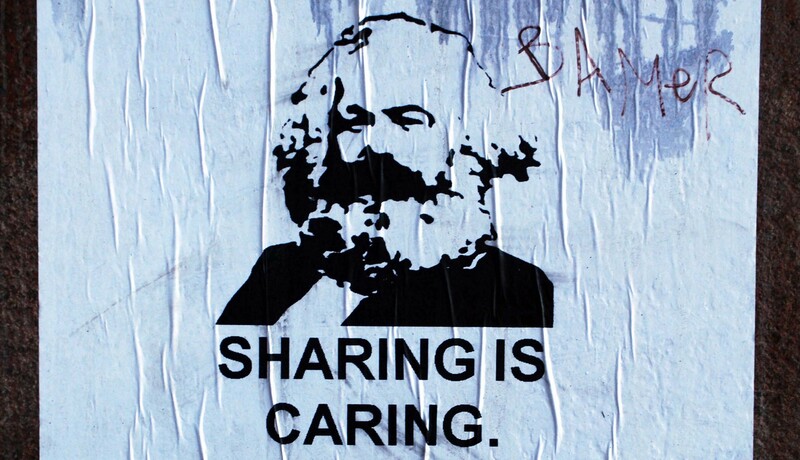 Shares also affect trust. 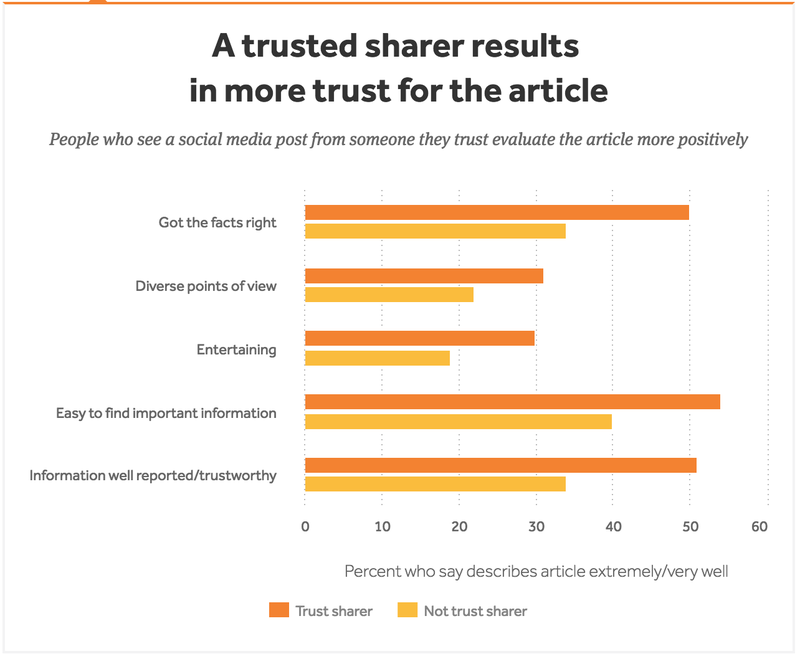 According to a recent survey by the American Press Institute, when people see something shared by a person they know, they’re more likely to trust that content and even find it entertaining. 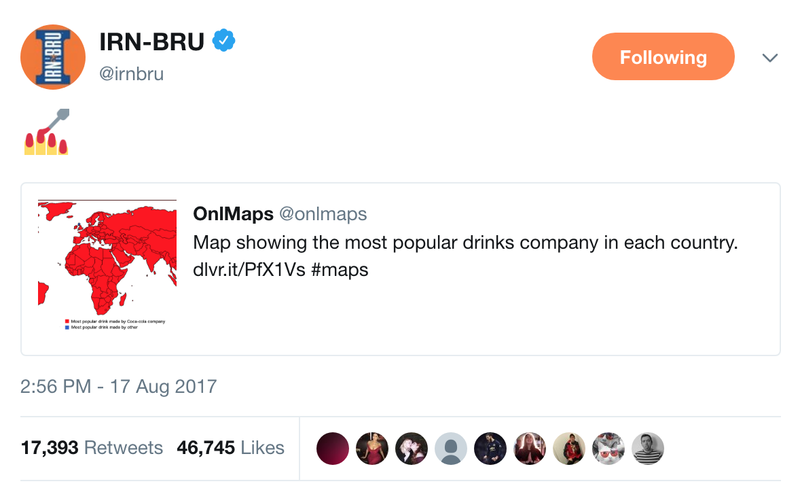 What brands are getting shared? 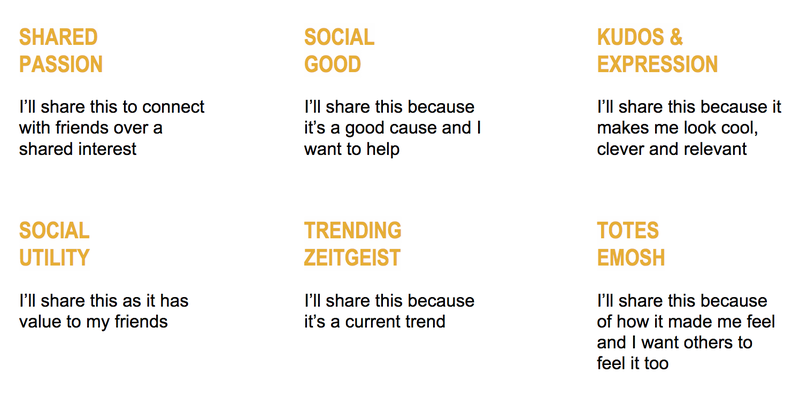 Some social publishers like Buzzfeed and upstarts like LadBible and UNILAD have got the whole sharing thing sussed. However, it’s harder for brands to create regularly shareable content. Top of the class, according to Unruly’s most shared video brands, is unsurprisingly Red Bull. Nike and Adidas are also up there with their mega-budgets and high-profile sponsorships. More surprising is Shell getting shared (although budgets may have something to do with this) and Almarai (I had to look them up, they’re a Saudi food group). Ludicrous budgets definitely help, but often lo-fi efforts can do well too. 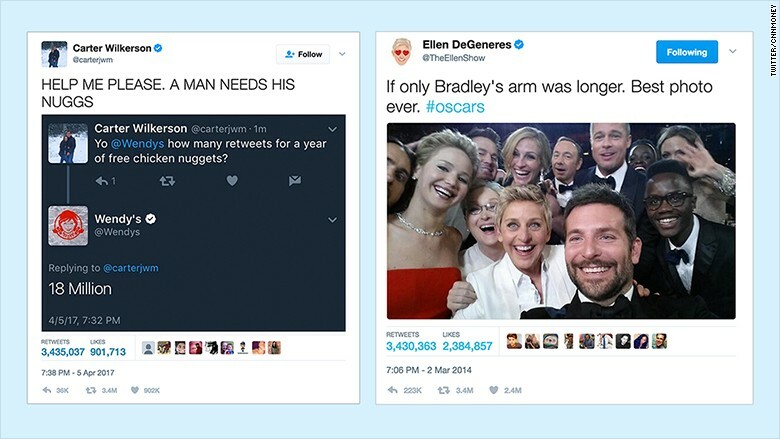 The most retweeted tweet ever was a screenshot of a Twitter feed. Nuggs For Carter takes over as the most-shared tweet of all time. And a recent tweet by AS Roma got over 180k retweets for showing pure, unadulterated joy through garbled letters. Money and perfection don’t necessarily equal shares. This isn’t going to mean much to mere mortals, but how they visualise online diffusion is more helpful. Content distribution, represented by moustaches. As creators of content, we tend to think in the broadcast mindset — create something, publish it, put some spend behind it and off it goes. 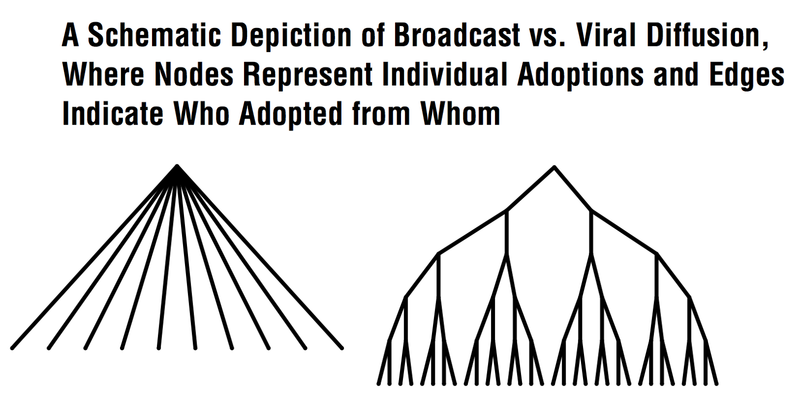 But if you take sharing into account when planning and creating the content, you’re much more likely to achieve the ‘viral diffusion’ spread indicated on the right. Don’t just titillate folk, make them horny as hell. The more people feel, the more they share, so however you want people to respond, the more intense the better. This is a lesson to planners, creatives and clients alike. The safer option is always to err on the side of moderation. But this doesn’t lead to content that flies. It leads to content that stays firmly on the ground, like a flightless emu. The book also claims that people tend to prefer positive responses over negative ones. Videos which provoke a strong positive response are 30% more likely to be shared than those which provoke strong negative emotions. If you’re going to put people in a state of High Arousal, make it Positive. Inspiration and Astonishment led to a cool 1.9M shares of this shed. However, if you want people to really remember your content, then exhilaration is a massive contributing factor. 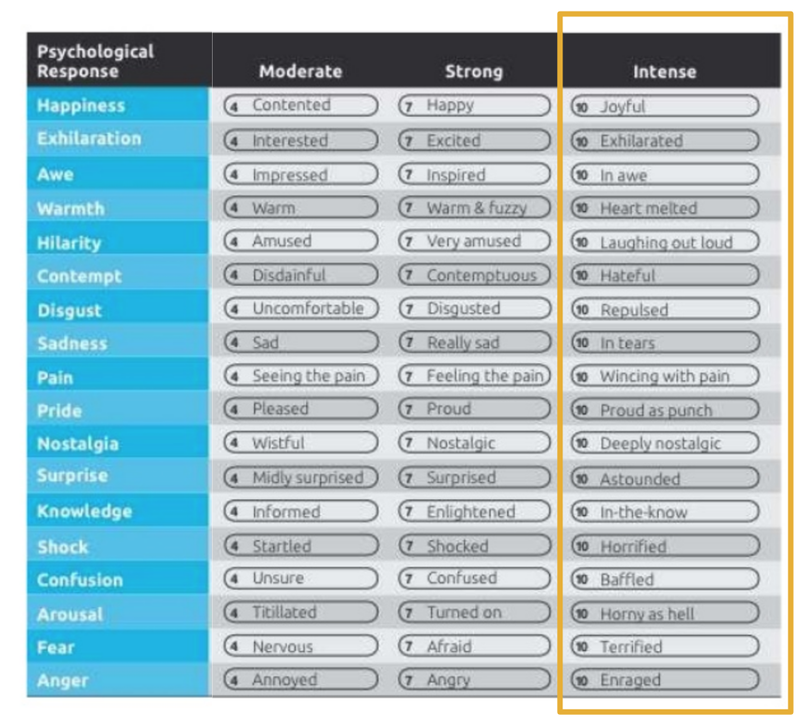 Strong positive emotions get content shared AND remembered. Exhilaration is the most successful trigger with 65% recall. Which makes perfect sense when you look at how successful Red Bull and GoPro have been with their video and sponsorship strategy: exhilaration equals memorability and mega shares. Validation is a primary human motivator. We all want to look bright, funny, entertaining and knowledgeable. Before the internet we had to do this in real life (erk! ), but now we just have to share stuff on social to externalise our character. With this in mind, it’s always worth considering why someone might share a piece of content. Ideally you want a few of these motivators at play. If it doesn’t tick any of these boxes, chances are it ain’t gonna fly. Another thing to ask up front is what communities of interest does the content appeal to? People share stuff that taps into a niche that they think others in this group will appreciate. If these niche interests overlap, then all the better. Bit of an oldie but still relevant… Mike Arauz’s deconstruction of why an infographic that went out at the height of Tiger Woods’ relationship struggles got shared a lot. If we do a similar exercise for a piece of content we published last year (17k shares) we can see a similar overlap of interest groups. We’d love to claim this was carefully planned (it wasn’t), but it’s helped us to sharpen up our planning process — we now consider why people will share whatever we post. It’s a discipline that forces us to re-consider a lot of our initial suggestions. People also appreciate practical value, rather than a stream of purely promotional messages. Keywords like “learn”, “how to” and “tips”, where relevant, help to generate shares. One of the most shared Faceboook posts of 2017, sitting pretty at 12M shares. This static image got 1.2M shares across various networks last year. Stories have an enduring power to inspire, inform, persuade and motivate audiences. While championing storytelling for good marketing is nothing new, it’s still useful to see how original creativity plays a big part in sharing. Evan got shared a lot for a number of reasons — the main one being an unpredicatable story twist. And if in doubt, post it on a Thursday. Jim Wolff (Head of Digital) and George Gunn (Content Strategist) are behind Leith’s social and content activity. If you want more thinking and action where this came from, get in touch.